Na życzenie jednego z czytelników przedstawiam płytę Annette Peacock I'm The One z 1972 wraz z wcześniejszym projektem pod nazwą Synthetiser Show - Revenge z 1969 roku - nagranym wspólnie z Paulem Bley'em. Annette Peacock to bardzo interesująca pianistka i wokalistka jazzowa. Była jedną z ikon kontrkultury biorąc udział w pionierskich doświadczeniach nad świadomością dr Timothy Leary'ego. Zajmowała się również makrobiotyką. Pod koniec lat 60-tych poznała swojego pierwszego męża i rozpoczęła przygodę z jazzem w różnych eksperymentalnych składach m.in właśnie z Paulem Bley'em. Koniec lat 70-tych to romansowanie z bardziej komercyjną i melodyczną linią jazzu (powiedziałbym soft-jazzu). Annette Peacock's work as a vocalist, pianist, and composer is austere, cryptic, laconic, minimalistic, and relentlessly individual. Her dry delivery and penchant for stark, stripped-down musical "environments" have made her something of a cult figure and an icon of the avant-garde. An early participant (1961-1962) in Dr. Timothy Leary's psychedelic culture experiments and a longtime adherent of Zen Macrobiotics, Peacock has been releasing albums since 1968. But her career has been marked by fairly long periods of silence; this partly explains her relative obscurity. Aside from a brief period of formal study at Juilliard during the 1970s, Peacock is entirely self-taught. Born in Brooklyn, she began composing by the time she was five. Her first professional association was with saxophonist Albert Ayler, with whom she toured Europe in the 1960s. She soon began to write in an idiom she calls the "free-form song," which emphasizes the use of space in contrast to the busy, cacophonous tendencies of free jazz. During this period she met and married her first husband, the double bass virtuoso Gary Peacock. She also began to write material specifically for the avant-garde pianist Paul Bley and his trio. For decades, Bley has remained one of her most devoted interpreters. Among her other accomplishments, Peacock is an unsung pioneer of electronic music. Years before the commercial emergence of synthesizers, she received a prototype from inventor Robert Moog. This prompted her to synthesize her own voice, which according to most reports had never been done before. 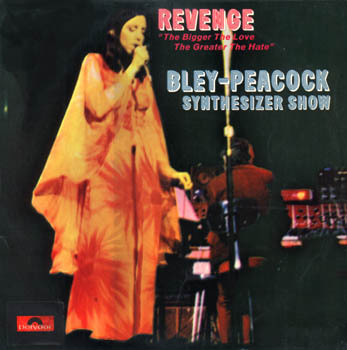 Ultimately these experiments brought about an innovative 1971 album, The Bley/Peacock Synthesizer Show. Despite her decidedly unorthodox profile, Peacock has had several interesting points of contact with mainstream culture. In 1978 she sang three songs on Feels Good to Me, a minor classic by progressive rock drummer Bill Bruford. Her song "My Mama Never Taught Me How to Cook" appears on the soundtrack of Kevin Smith's 1997 film Chasing Amy. And a sample from Peacock's song "Survival" crops up in "Tell 'Em Yu Madd" by Militant the Madd Rapper featuring Busta Rhymes. Most notably, David Bowie has shown interest in Peacock's work over the years. On his 1999 album Hours, the rock legend makes a fairly explicit reference to Peacock's song "I'm the One." Bowie subsequently invited Peacock to collaborate. In the current musical environment, where at times it seems there's a new "genius" born every minute (or reclaimed from a long-forgotten artistic nascence as part of a current performer's latest vanity project), genuinely singular and innovative artists possessed with an individualistic approach, a distinctive voice, and a determination to achieve artistic success their own terms at the expense of commercial acclaim and subsequent return all too often go unheard, underappreciated, and marginalized. Such artists might, a cynic might argue, have been better advised to court controversy or to abandon their art temporarily, only to re-emerge phoenix-like with the aid of a contrived promotional backing, like a re-launched brand. Said cynic might further develop this argument by suggesting that for such artists to continue to work sporadically, often not at all for substantial periods rather than not on their own terms, with limited resources and promotion, was simply foolhardy. This is where Annette Peacock comes in. Since her first performances and recordings in the 1960s, Annette Peacock has sought to express herself via her art, as have many other artists. Unfortunately, she has consistently fallen foul of unwritten laws. Inasmuch as she writes and sings her own material, she could be conveniently classified as a female singer-songwriter. The commercial potential (or lack of it) of her material notwithstanding, she might have attracted some critical attention via this contextual niche in the marketplace. Unfortunately, because her perceived musical background, resulting in her unique musical voicing, was in the modern jazz tradition, she has been dealt with as a musician, which, the musical abilities of artists such as Carole King and Joni Mitchell notwithstanding, violated one of the established tenets of this genre. Result: Annette Peacock is not a singer-songwriter. Inasmuch as her perceived background and musical upbringing was rooted in the modern jazz tradition, she could be conveniently classified as a jazz performer. The commercial potential (or lack of it) of her material notwithstanding, she might have attracted some critical attention via this contextual niche in the marketplace. Unfortunately, because she performed her own intensely personal compositions and was never a bandleader in the jazz tradition, she has been dealt with as a singer-songwriter, which, the career and oeuvre of, say, Nina Simone notwithstanding, violated one of the established tenets of this genre. Result: Annette Peacock is not a jazz performer. Inasmuch as she was one of the first musicians to experiment with synthesizers and remains one of the few to have perceived and harnessed their potential as a means of processing other sounds, rather than as a new model of electronic organ, she could be conveniently classified as an electronic music innovator. The commercial potential (or lack of it) of her material notwithstanding, she might therefore have attracted some critical attention via this contextual niche in the marketplace. Unfortunately, because her electronic innovation was an integral part of her special approach to her music, she has been dealt with as either a singer-songwriter or a jazz performer, which, the careers and oeuvres of, say, Brian Eno and Sun Ra notwithstanding, violated at least one of the established tenets of this genre. Result: Annette Peacock is not an electronic innovator. Inasmuch as her lyrics have dealt with issues such as fetishism, masturbation, celibacy, nuclear disarmament, and individual responsibility in a political context, and they are delivered via an extraordinarily expressive and distinctive vocal style, she could be conveniently classified as a flamboyant rock performer. The commercial potential (or lack of it) of her material notwithstanding, she might therefore have attracted some critical attention via this contextual niche in the marketplace. Unfortunately, because her perceived flamboyance is only a part of her distinctive approach and she has not sought the limelight, she has been dealt with as a serious artist. Notwithstanding the careers of David Bowie and Salvador Dali, this perception of her violated at least one of the established tenets of this genre. Result: Annette Peacock is not a flamboyant rock performer. I'd hazard a guess that her past and present recording companies have not been entitled "Ironic" without good reason. You may have gleaned some degree of conscious repetition in the preceding few paragraphs. 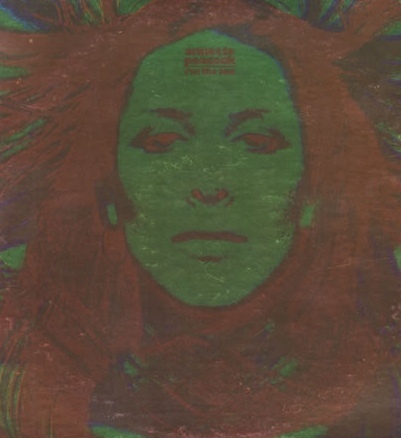 This was done partly for so-called comic effect, but also in order to highlight and emphasize the "Annette Peacock problem": to wit, the deeply personal nature of her music. This is the key to her lack of recognition and success, in my opinion. Her vision and its manifestation through her approach to all aspects of her music is of such an individualistic nature that it all but negates any potential crossover potential she may have had. And it's partly this purity that has prevented her from being heard by a wider audience and from receiving something approaching the acclaim she deserves. Despite the fact that she could be perceived as encompassing aspects of several musical genres, her singular character and approach results in a singular music that defies definition. Not that she's unique in this respect; it's more that other artists who could reasonably be described thus make more impersonal, more emotionally abstract music (e.g., Captain Beefheart, Bjork and even David Bowie) that demands a less direct connection from the listener. Annette Peacock's music, both in its lyrical style, mode of delivery, and song form, is more organic, more conversational and confessional--more the ideal of the so-called singer-songwriter approach. However, her work reaches far beyond the one-dimensional platitudes of the cliched archetype of that genre than that of most so-called cult figures of contemporary music. Of course, part of the reason she's not better known and more renowned may be due to reluctance on the part of listeners to engage in the dialogue her music demands. It is not demanding in the sense that it takes effort to understand it, but it is inclusive and makes demands in a different way. It asks you questions, makes you think, disrupts your flow (lyrically and musically), and calls into question the role of the listener as a passive onlooker and recipient of product or even of a finished work of art, freshly polished and awaiting a critical verdict. Sadly, however, the main reason Annette Peacock's work is not better known is that so few of her recordings have been available on a long-term basis. Having experienced a string of record companies struggling to market music they did not appear to comprehend by an artist they could not begin to categorize, she was then, on the formation of the original Ironic label in the early 1980's, confronted by the inevitable financial pressures facing all independent companies. Even the reissues and retrospective compilations of her recordings are now hard to find. As such, only those prepared to look hard and spend big (with money Annette will never see) will hear them now. It seems tantamount to gloating to say that I possess copies of these recordings and will then to go on to describe them in detail, so I won't. However, one of the main reasons you're hearing about her now is the impending reissue (on her newly revamped Ironic label) of one of her most renowned and ground-breaking albums. too bad the link doesnt work. Either as torrent no seeds.Try with Rapidshare,Hotfile Filesonic or Megaupload! I really hope to download this gem!? Me again to thank you for working link! Divine Marvellous - I've been questing for this for many a long year. Thank you for being the first blogger to post it. Thank you. The link has been removed. Greetings. I tried to buy the album from Annette's Website / Inspiration Records and they dont seem to deliver. I'm not even sure if it was ever really published on CD, no online shop seems to have it in stock or avaible on purchase. I am on a desperate search for this album: I even purchased it for 30 bucks, (even though I'm pretty blank most of the time). Can you please, please repost this or send me an email with the link? So I'm really happy with it! It comes in a very nice digipak signed by Annette, with a booklet and lyrics. The sound quality is good, I'm not an audiophile, but to me it sounds detailed and differentiated. I first heard songs from this album on youtube and was pretty blown away. I think a lot of you searching for this album had this experience.. Annette's singing is astounding, very expressive. And the song writing stays versatile and exciting through the whole cd. Some parts have an excentric kind of quality, which makes them all the more fascinating. I don't want to waste somebodys time trying to picture music through words, but if you like what you already heard from Annette, & you want to enjoy more of this in great quality, don't miss this! I found the record and posted it on my blog so as to save you from trouble! Thanx for all the great music! Hello! Could you please help me find "REVENGE: The Bigger The Love, The Greater The Hate"? Can't find it anywhere... Please? Thanks a lot for that!